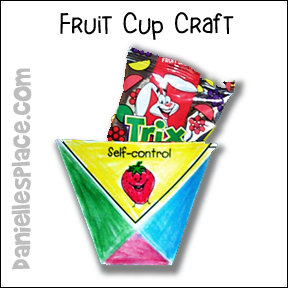 Children learn about self-control through Daniel's example of making the right choice about what he should eat. Complete lessons are available to members on The Resource Room and as an instant download below. 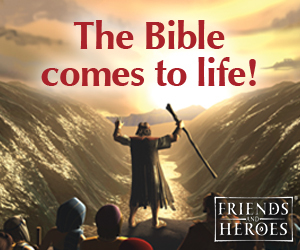 Available in both color and black and white, KJV and NIV. 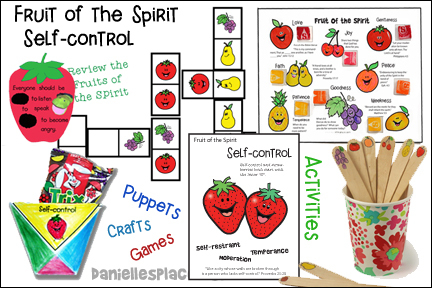 Use the colored patterns as posters to decorate your bulletin board. Use the black and white sheets for coloring sheets. Your children will enjoy decorating this cup that has the Bible verse on the back. 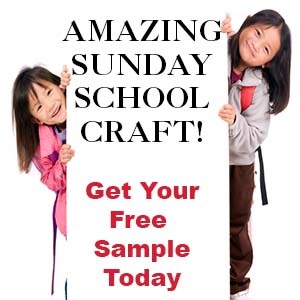 Children color a Bible verse picture and then glue Starburst candy on the picture gluing the matching flavor of candy next to the fruit. Have your students dip whole strawberries into colored sugar or melted chocolate. As you work talk to your children about self-control when eating. It is okay to eat sweets, but we must have self-control and not eat too many. We must also eat the foods that are good for us before we eat the foods that aren't as nutritious. 2. Shape the dough to look like strawberries and then roll them in two tablespoons or Jell-O mixed with red sugar. 3. Use green icing to make leaves. 1. Draw a large strawberry shape on red poster board and cut it out. Write the Bible verse on the strawberry using large letters ("Everyone should be quick to listen, slow to speak and slow to become angry" leaving out the words quick and slow. 2. Cut wholes large enough for Squirmy's head to fit through where the words should be. 3. 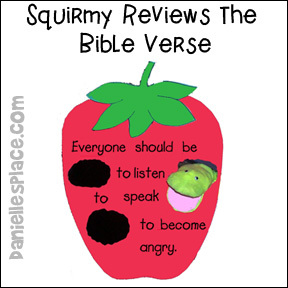 Tell the children that Squirmy is going to help us learn the Bible verse. Ask Squirmy what he did with the strawberry. Squirmy should say, "What strawberry?" And you say, "Squirmy, you remember the strawberry with the Bible verse on it." Squirmy says, "Oh, that strawberry. I forgot about that. I'm afraid I didn't have much self-control with that either." Squirmy then brings out the strawberry. 4. Go over the Bible verse and have Squirmy pop his head out and say "slow" or "quick" in the appropriate place. Keep reviewing until the children remember the verse. (Older children) Pass out a sheet of paper to each child. Tell them that they are going to practice being slow to speak and quick to listen. Tell them to do exactly like you say. They have to listen carefully because you aren't going to repeat yourself. It is very important that we learn to control our mouths and our ears to know when we should speak and when we should listen. Today we are going to practice listening. Make the directions match your children's age. The older the children the more directions you should give at one time. Have them draw a design on their paper as you explain what to draw. For example, you can say something like this. 1. Draw a big circle in the middle of your paper. 2. Draw a line though the circle from top to bottom, cutting the circle in half but don't make the line go outside the circle. 3. Draw three small circles on the left side of the big circle, one on top of the other, but not touching each other. 4. Draw three X's on the right side of the big circle, one on top of the other but they should not be touching. The bottom one should be bigger than the middle one and the middle one should be bigger than the top one. When the children are all done have them compare their pictures. How well did they do listening to the directions? This game is played like Duck, Duck, Goose but instead of the children saying "Duck, Duck, Goose, they say the Bible verse. The first child says one word of the verse each time he taps a child's head. When he comes to the last word of the verse, he runs around the circle while the child who was tapped last chases him around the circle to his space. Divide your children up into two or more teams. Take turns asking the teams review questions from all the Fruit of the Spirit lessons. If a team answers a question correctly, place a fruit in that team's bowl. The team that gets all their fruit in the bowl first wins. 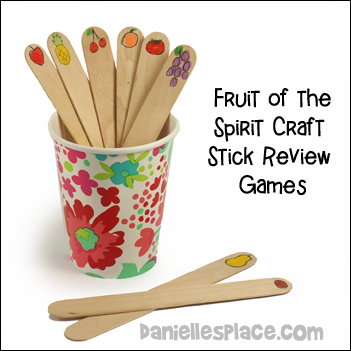 In class give each child a stick and play some review games using these sticks. 1. Find Your Group Game - On the word "go" have your children get into groups according to their fruit. See how long it takes them to get organized. Have the children swap sticks and try again to see if they can do it faster. If you have younger children, you can place pictures of the different fruit on the wall in your room and have the children go to the fruit that matches the fruit on their sticks. When you point to a group have them shout out what their fruit represents. 2. Line Up Game - Divide the children up into groups with two different fruit per group. On the word "go" have them line up in a specified pattern such as "Lemon, grape, lemon, grape” or lemon, lemon, grape, grape, lemon, lemon". The team to line up correctly first wins. "Everyone who has the self-control fruit, say the memory verse." "Everyone who has the peace fruit take three steps backwards." 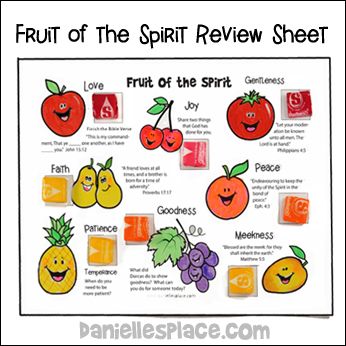 Children play dominoes with fruit pictures to help them remember the Fruit of the Spirit. This game is available to members only. Hi! I teach the preschool Sunday school class at my church. We are learning about the Fruits of the Spirit. Our fruit this week was PATIENCE. I used the story of Hannah for my lesson, as she must have had a lot of patience to have continued to pray for so long for a baby.